It has been more than 4 years since I started working with the Smallholder Farmers Alliance (SFA), a Haitian NGO that works to improve the lives of Haitian smallholder farmers while at the same time reforesting the country. My first work for the SFA was the Haiti Moringa Study, which I completed in 2015. Since then, the program has grown tremendously. Given the complex nature of our work in Haiti, it can at times be challenging to provide people with a good overview of all the things we work on. Good thing that is about to change now! Enter the book “Putting Practice Into Purpose – The Economic of Mutuality”, which has been developed by Oxford University in close partnership with Mars Incorporated (the company), and soon-to-be published. For those that are interested in getting an in-depth understanding of the work we’ve been doing in Haiti over the past years, here is an integral version of the chapter. Thank you for your interest and happy reading! Global outdoor lifestyle brand Timberland has established a partnership with the non-profit Smallholder Farmers Alliance (SFA) in Haiti to completely re-imagine the cotton supply chain and create a new system for producing cotton that maximizes benefits to smallholder farmers and export customers. Timberland designs, manufactures, and sells premium footwear, apparel, and accessories for the urban outdoor lifestyle. The company’s dedication to making quality products is matched by its longstanding commitment to environmental and social responsibility to make it better with respect to responsible products, protecting and restoring the outdoors and supporting communities around the globe. Timberland has over 7,000 employees worldwide and generated $1.9 billion in revenues in FY 2018. The Smallholder Farmers Alliance is a Haitian non-profit organization co-founded in 2010 by Hugh Locke and Timote Georges with the objective to plant trees in Haiti. 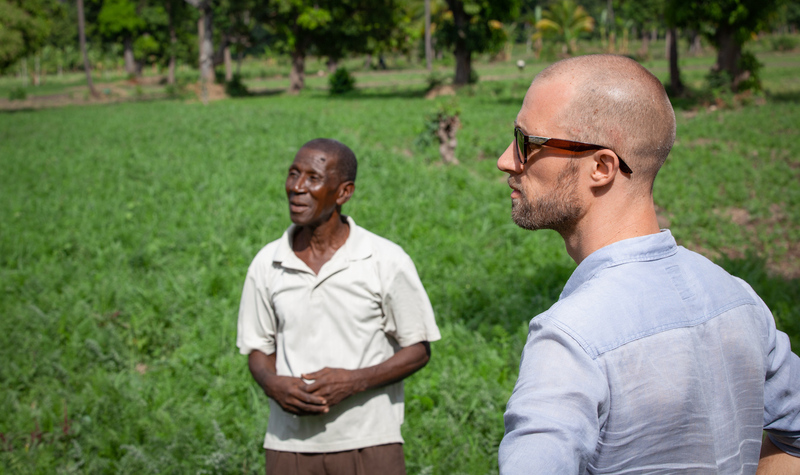 The SFA applies business solutions to help feed and reforest a renewed Haiti by establishing market-based farmer cooperatives, building agricultural export markets, creating rural farm businesses, and contributing to community development. The SFA is organized as a foundation under the laws of Haiti. The new supply chain is built around next-generation data and aims to be blockchain-ready. This will enable the partners to measure the economic, environmental, and social benefits for smallholders— farmers who farm less than two hectares or five acres of land— while at the same time measuring success for potential customers such as Timberland, Vans, and Patagonia in terms of increased transparency and efficiency. The partnership will ultimately enable a new supply chain for Haitian-grown cotton to come to life through a blend of philanthropy and commercial investment. The partnership is currently incubating a social enterprise, which will deliver both agricultural and community services from profits. The SFA has also built an innovative ‘tree currency’ approach that allows farmers to reduce their cost of operation by earning agricultural credits for seed, tools, training, and financing in return for planting trees. 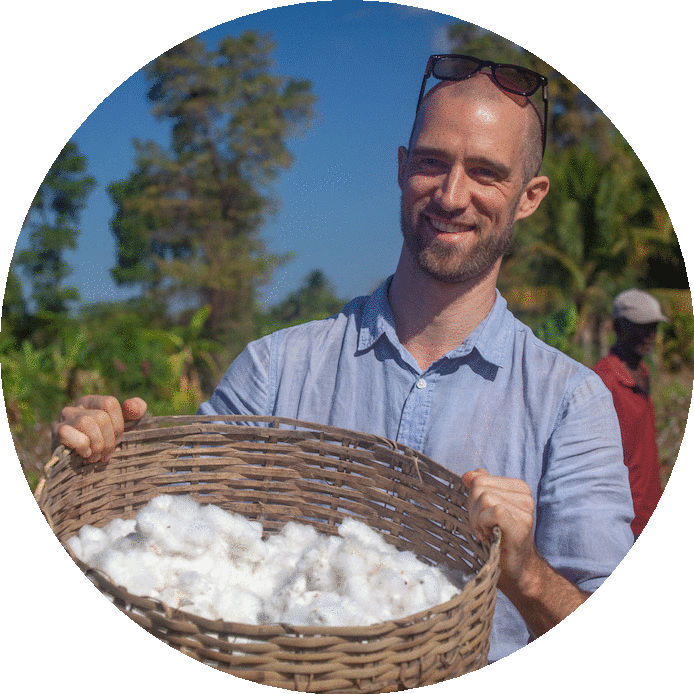 While the partnership’s current focus is to reintroduce organic cotton farming to Haiti, this smallholder supply chain design and its related data management system has the potential to be applicable to any smallholder-grown crop anywhere in the world. Haiti is one of the most deforested countries in the world, and the severe lack of tree cover reduces agricultural productivity, raises average temperatures, and makes rural areas more susceptible to flooding. Further complicating the situation, low agricultural productivity means that farmers turn to cutting trees and making charcoal to supplement their low incomes. This locks rural Haiti into a cycle of deforestation, low productivity, and poverty. Locke and Georges thought the best way to break this cycle was to pay farmers to plant trees. This would make trees worth more in the ground than cut for charcoal. They approached Timberland for funding: the company had a factory in the neighbouring Dominican Republic and a history of sponsoring tree planting in various countries. Timberland agreed to be the SFA’s corporate sponsor, but with two conditions. First, they challenged the organization to plant five million trees in five years to meet a commitment the company made through the Clinton Global Initiative. Second, the SFA had to make the programme self-sustaining. This meant that simply paying the farmers in cash to plant trees would not work, as the project would stop when Timberland’s five-year funding commitment was complete and they needed a solution that was not reliant on external funding. In rethinking the basic model, Locke and Georges realized there were three things that almost every farmer in Haiti needed but could not access: good quality seed, basic hand tools, and agricultural training. They asked farmers if they would plant trees and accept payment in the form of farm credits that could be exchanged for seed, tools, and training. The farmers agreed, and the SFA created tree nurseries where the farmers could work and earn these agricultural services. The SFA also developed a plan to make the resulting operation self-financing over a period of years through a combination of establishing seed banks and training the farmers from the outset to one day take over the operation. In 2010 the programme launched. Within weeks, hundreds of farmers had joined, and their numbers rapidly grew to more than a thousand. The SFA created tree nurseries as fast as possible, but finally had to limit the programme to 1,500 farmers. Over the next few years the programme gradually grew to engage some 6,000 members on 3,000 farms; the SFA recognizes husband-and-wife teams who farm together as separate and equal members. The SFA currently operates 31 tree nurseries in six locations throughout Haiti. The SFA met Timberland’s original challenge to plant five million trees in five years. By 2018, the smallholder farmers who work with the SFA had planted close to seven million trees. Farmers grow fruit trees, which they plant on their farms and in small orchards. They plant trees as living fences and to stabilize deforested slopes that contribute to flooding. They have reforested large tracts of community land that will eventually be connected to form the first green belt of its kind in Haiti. All these trees in the ground have earned farmers better seed, tools, and training that have, in turn, resulted in an average 40% increase in their crop yields, all grown using organic principles, and an average increase in household income of between 50 and 100%. The participating farmers helped Locke and Georges realize that, in designing a model through which planting trees earned agricultural services, they had actually created a form of currency: tree currency. This realization came as the farmers began to ask for additional services in exchange for their farm credits. Some of these requests were directly related to agriculture, such as using credits to buy livestock or improve irrigation. But increasingly the farmers asked to exchange credits for community services including adult literacy classes, basic business training, and a micro-credit bank with loans for women farmers. And it was the farmers themselves, with just a bit of guidance and support from the SFA, who implemented all these services. Another benefit was the revival of an agrarian tradition which had previously been on the verge of disappearing. Kombit is a Haitian creole word that refers to farmers coming together at planting and harvest times to share the workload. One farmer explained kombit best when she said, ‘We now work together for the common good and I care about the community as I care about my family.’ Kombit is also the name Timberland gave to a 2015 documentary film about its tree planting work with the Smallholder Farmers Alliance in Haiti. In early 2015 the SFA published a feasibility study for moringa. The leaves of this fast-growing tree are unusually high in protein. Timberland and the Clinton Foundation helped introduce the SFA to a U.S. company called Kuli Kuli that asked if the SFA’s smallholders could grow moringa trees and have women farmers process the leaves into dry powder form. Kuli Kuli’s Moringa Green Energy shots, which were developed to incorporate SFA-sourced moringa, are now on shelves at more than 400 Whole Foods Markets across the U.S.A. This marked an important transition towards producing export crops. Seeing the success of the moringa crop led Timberland to consider how they might move from being an SFA sponsor to a customer of SFA-grown organic cotton. The first challenge was that although cotton had once been a mainstay of the Haitian economy, it had not been grown in the country commercially for over 30 years. Timberland sponsored an SFA-led feasibility study to determine if it made sense even to consider cotton’s possible return. The final study was published in late 2016 and clearly stated that the Haitian cotton industry collapsed because of politics and policies of the time rather than for agricultural or climatic reasons. The study recommended that cotton be reintroduced as a crop for smallholder farmers, who had grown at least 80% of the crop historically. The next challenge was that there was no seed stock left in the country. In August 2017 the SFA set up a field trial with annual cotton seed varieties from Brazil, India, and the U.S.A,, and with one perennial variety still found in Haitian gardens. Six months later the SFA farmers harvested the cotton and published the results. The first commercial planting by 100 farmers was completed in summer 2018 and harvested in the first two months of 2019. In its new role as a customer of the SFA, Timberland has made a commitment to buy, through its fabric suppliers, up to one third of its entire cotton supply from the SFA. 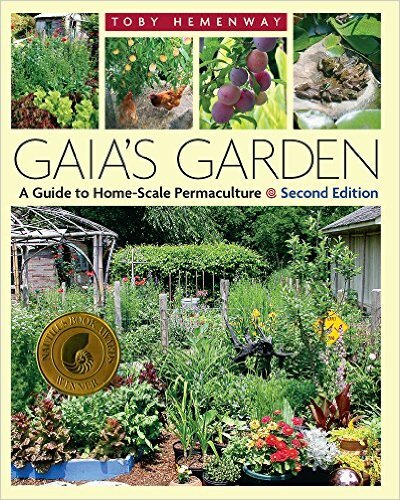 This is on the condition that it is grown organically, and available at the appropriate price, quality, and volume and to ensure it is not overly-reliant on one company. Timberland anticipates having a fabric supplier make a first purchase of ginned cotton in mid-2019. Timberland has also helped to secure interest from the skate and lifestyle brand Vans and outdoor clothing company Patagonia to help ensure a receptive market and increase the project’s potential scale. The SFA aims over the next five years to have 14,000 farms growing organic cotton, with an estimated annual output of around 10 million pounds for export. To maintain food security, SFA farmers will be restricted to using only half their land for cotton. The 40% or more increase in crop yield that is expected when farmers are newly introduced to the SFA will offset any impact on food production due to cotton growing. Also, since cotton only takes six months to mature, farmers can plant an additional food crop each year on the cotton half of their land. And because the basic SFA tree currency model remains intact—that is, farmers working in nurseries to grow, transplant and look after trees to earn cotton and food crop seeds, tools and training—the SFA estimates that the farmers will plant an additional 25 million trees during those five years. The original goal of the SFA was to plant trees. It created an agricultural services arm to incentivize farmers to plant those trees. Then it added community services in exchange for tree planting. Finally, it introduced two high-value export crops, moringa and cotton, with inputs still earned by planting trees. And while tree-planting has remained a constant, the stakes are now much higher than when the organization began. The whole operation was getting too big to manage as an NGO and so, in 2018, the SFA decided to transform itself into a socially minded business. The SFA will create a new for-profit company in which the SFA and farmer cooperatives will be minority shareholders. Over the course of the first five years, the non-profit SFA will work alongside the new for-profit company called Haiti Rekòt, which translates as Haiti Harvest. During these five years a blend of grants and capital investment will support the combined operation. At the end of five years of blended operation and blended funding, Haiti Rekòt will take over the entire operation and will implement all agricultural and community services entirely from profits and without the need for any further grant funding. It is important to note that the business for the for-profit entity and model is based on commercial prices for cotton and other crops, with no subsidies. The transition from a grant-based model to that of a financially viable supply chain demands new approaches and more robust data management. The classic definition of an agricultural supply chain is that each step of a product from the farm to the end-consumer is tracked and measured to improve efficiency and manage overall costs. Haiti Rekòt has revised this definition by adding the tracking and measuring of social and environmental impacts. How it supports women’s empowerment. Supply chains require data-tracking to manage efficiency and costs. And if a supply chain attempts to incorporate the measurable impact of an agricultural product on smallholder resiliency, food security, climate change, and women’s empowerment, it needs to determine baseline data, track changes, and quantify that impact. At the same time, smallholder farmers themselves need access to data. Less than 10% of the farmers in Haiti could tell you what their input costs are, what their sales were last season, or what their net profit is for any given year. Yet they know if their family is well fed, if their household is secure, and if their children are in school in a country where there is almost no state education and most have to pay for schooling, starting in grade one. But to run their farms at maximum efficiency and profitability, farmers need access to better data. When the SFA was in the early stages of exploring data management, Timberland asked if it was possible to combine the farmer and supply chain needs with the company’s interest in using data to improve the efficiency and transparency of the organic cotton. This meant that the SFA was looking at very simple data needs at the farmer-end and increasingly complex data needs further along the supply chain towards Timberland and its consumers. This seemed a daunting task until a very simple and obvious approach emerged that was, at the same time, profoundly disruptive. To help create a data system that incorporates what seems to be very disparate goals and modes of operation, the SFA has put together a team that includes Timberland along with two expert organizations—the Better Sourcing Program and RCS Global—that have pioneered the real-time capture and reporting of quality data from small-scale miners. Into this mix, the team added being “blockchain ready” to determine how to potentially incorporate this, or a similar form of a secure digital ledger. The data system exploration began by engaging seven graduate students from Columbia University’s School of International and Public Affairs, through what they call their Capstone Project. These students canvassed the world to identify every data management system that is specifically designed—or could be adapted—for use by smallholder farmers and could also accommodate the more complex needs of a supply chain that included blockchain technology or something similar. After studying 44 possible systems, the one that showed the most promise was an e-voucher system developed by the Food and Agriculture Organization (FAO) in Mozambique. This is based on each farmer having a unique digital ID that is biometrically accessed rather than requiring a password—an important factor for a sector of the population with historically low levels of literacy. This was the only system that had been designed with an understanding of the farmers’ needs. All the others appeared to have been conceived at a meta-level and then applied down the supply chain until at last reaching smallholder farmers. The designs were too complicated, too expensive, or were incapable of being modified to meet real needs. The team also found that none of the systems was ready to incorporate blockchain properly or efficiently. These insights led to the next realization that, when it comes to designing a data management system that can accommodate both smallholder farmers and global corporations, the complexity involved is directly related to the starting point for the design. If you begin at the meta level and work backwards, the complexity and problems seem to increase as you get closer to the farmers. But if you start with the farmers and work your way up, you can begin with something as simple as paper records and excel spreadsheets and be ready to add anything up to the level of blockchain. The key is to design a data management system that is both simple and easy to use, and then gradually add layers of complexity as the basic data gets combined in different ways. In the spring of 2018 the SFA tested an initial beta version of its farmer-level data system that is based on excel spreadsheets. By mid 2019 the SFA will have completed the technical specifications necessary for a program developer to design a new unified data management system that is blockchain-ready. This will be followed with a pilot test focused on organic cotton farming in Haiti. The implications of blockchain type data tracking are compelling for retailers such as Timberland that imagine a time when consumers can scan a code on a product hang tag to access information about which farmer grew the cotton and where. What organic protocols were involved in growing the cotton? What impact did it have on the farmer and his or her family? How did growing that cotton affect the environment and food security? How did the community benefit? What was the impact on women farmers? Timberland believes that customers will increasingly want this kind of transparency in the supply chain that brought them a given product and that this information can help inspire people to make more responsible buying decisions. Currently some 100 million smallholder farms produce 75% of the world’s cotton. Adjust the lens to include any kind of crop and the final count is 500 million smallholder farms throughout the developing world. Add up the people who live and work on those farms and that translates to 2.5 billion individuals, which is a third of all humanity. Simply put, with numbers like that, data-driven smallholder supply chains have the potential to change the world.